Reporter Darwin BondGraham, editor Kathleen Richards, and news editor Robert Gammon. Hey, we won an award! The Express was selected to receive the 2017 Best News Media Reporting Award by the California Grand Jurors' Association. 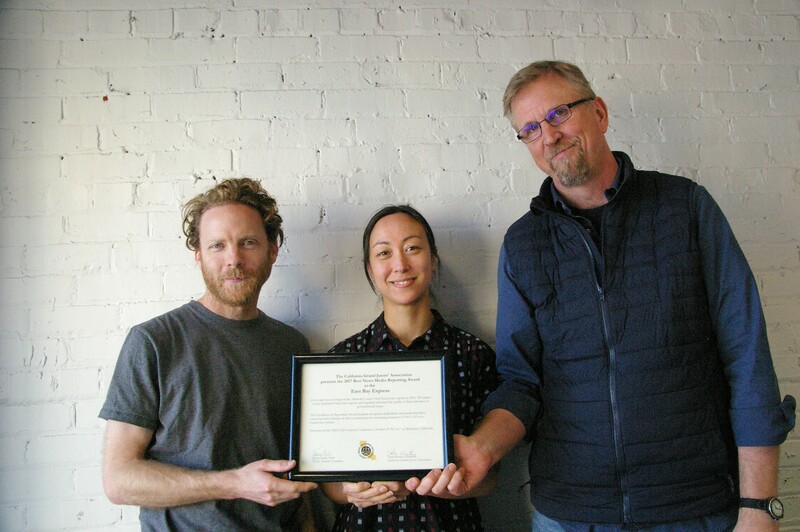 "The award recognizes the East Bay Express’ rigorous coverage of the Alameda County Civil Grand Jury (Alameda County Chapter) reports in 2016," the association wrote in an email. "The paper clearly analyzed Grand Jury reports and regularly informed the public of their relevance to governmental issues." Actually, it's a cyclical relationship. Our reporting has touched off several grand jury investigations, and then we've reported on the investigation's findings, which often confirm our initial reports. Here's an example: In 2015, Express staff reporter Darwin BondGraham uncovered how Oakland Councilmember Lynette Gibson McElhaney used her office resources and staff to block a townhouse project next to her West Oakland home. The story, "Records Indicate that Gibson McElhaney Used Her Council Office for Personal Gain," resulted in an Alameda County Grand Jury investigation that confirmed what BondGraham had initially reported. In another example, in 2015, BondGraham wrote about a proposed sale of city-owned land to construct a luxury apartment tower, which appeared to violate state and local laws. The grand jury then confirmed our reporting in its own findings. The California Grand Jurors' Association is composed of current and former grand jurors from throughout the state and is "dedicated to promoting the understanding of the unique practices of grand juries in California and to educating the public and prospective grand jurors about the beneficial oversight function of this system." The award was presented at the California Grand Jurors' Association's annual conference on Oct. 29, 2017, in Seaside, Calif. We couldn't make it, however, so representatives from the Alameda County chapter stopped by our office on Tuesday to give it to us. Thanks!